Dusek's Board & Beer celebrates the enduring link between beer, food and hospitality. With a beer-inspired menu designed by Michelin-Starred chef Jared Wentworth and food-friendly beers on tap, we pay homage to Mr. Dusek, re-establishing the same neighborhood spirit to this corner where his family tavern once lived and breathed. Punch House, located in the basement of Thalia Hall, invites you to circle round a bowl of punch and lose track of time. 'Punch', borrowed from the Hindi word 'Panch' (meaning five) refers to strong, weak, bitter, sour, and sweet, the five flavors in every batch of punch. 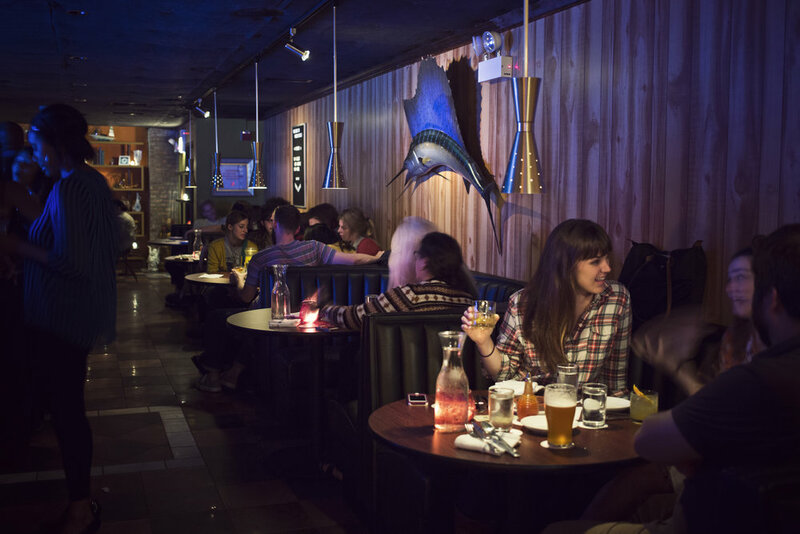 Eight punches on tap plus wood-paneled walls and a mesmerizing fish tank make for the perfect party atmosphere. Revival Food Hall is an all-local dining concept spotlighting the best of Chicago’s acclaimed culinary scene under one roof. The massive, 24,000 square foot marketplace is located in the heart of Chicago’s central business district, on the ground floor of The National – a restoration of a historic 1907 Daniel Burnham-designed 20-story building. Located adjacent to Dusek's Board & Beer, Tack Room was built in the same space as the stables where Mr. Dusek kept his horses. An exposed brick wall, exposed ceiling pipes, a wall of windows and galloping horse wallpaper make the Tack Room a playful and welcoming environment for your group. Thalia Hall is a landmarked historic building originally built in 1892 as a Czech meeting hall. As of 2013 it has reopened and been re-imagined as a modern day town hall; a central meeting place with a tavern (Dusek's Board & Beer), a bar (Punch House) and a world-class performance space (Thalia Hall). Located just under Dusek's Board and Beer, just behind the bookcase, our intimate private dinning space "The Beer Cellar" is also home to our supply of large format beers and wines. Its reto-chic vibe is perfect for cozy dinner parties, client meetings & rehearsal dinners. The Juice Box is our offsite mobile beverage catering. For those occasions when you need booze brought you, rent one of our mobile boxes, choose for favorite cocktail and we'll bring the party. Inspired by the fire pit council rings at Promontory Point, this neighborhood destination’s restaurant & bar are designed around a brick hearth that reflects simple traditions in a modern context. Drawing inspiration from the open hearth, the cocktail program focuses on modern twists on classic cocktails; and the wine program highlights historically significant wine regions and forgotten grape varieties, giving the list a uniquely curated character.